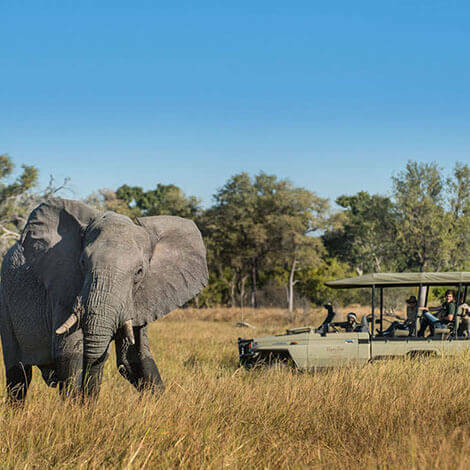 This itinerary is the Full Monty of Botswana safari itineraries, and we’ve packed a lot into eleven days. The Hidden Migration is all about taking the road less traveled and exploring the wildest corners of this phenomenal country, including Makgadikgadi Pans National Park, the infamous Salt Pans, and the fabulous Khwai Private Reserve. Your adventure begins in the Makgadikgadi Pans National Park, home to the second largest migration of mammals on the continent and our wonderful Meno a Kwena camp that boasts an unrivaled outlook over the wildlife-filled Boteti River. Then it’s off to the Makgadikgadi Salt Pans, an otherworldly place that enchants all that visit, for game drives amongst desert-adapted wildlife and walks with ancient bushmen. You’ll end your trip in the green and grassy Khwai Private Reserve. With three different camps (including a five-meter high ‘skybed’), game drives, walking safaris and mokoro trips, there’s plenty to keep you busy. Note: Single Supplement is an additional cost which applies to individuals traveling alone. Meno a Kwena road transfers depart the airport at 14h00 for camp and depart camp for the airport at 10h00. Any deviation from these transfer times/destinations will incur a private transfer cost of US$400 NETT per vehicle one way. Accommodation at the hotels, game lodges or rest camps specified in the itinerary, on the basis of two persons sharing a twin-bedded room with en suite bathroom, or shower / toilets. Meals from arrival in camp to the end of the scheduled safari and a reasonable amount of drinks. Transportation by 4X4 specially designed safari vehicle, with qualified driver, for all journeys specified. Scheduled activities, Conservancy fees, for sightseeing excursions specified. English Speaking tour guide and tracker services for walking experience. Full Pre-departure and final documentation with detailed “Guide to Planning your African Safari”. International airfare, inter-camp airfares are not included. Flights from/to either Maun or Kasane are not included and must be added. Items of a personal nature, telephone calls, premium imported brand beverages, personal purchases, optional extra activities, etc. Any meals or activities not listed, or any services not specified. Age Limits – Minimum of 12 years for starbed experience. For families with children under 12 years, please contact safariline for details. Registration: A 25% deposit of the total land price, per person is required. The remainder of the cost is due75 days prior to departure date. Airline tickets must be purchased within two weeks of reservation confirmation.